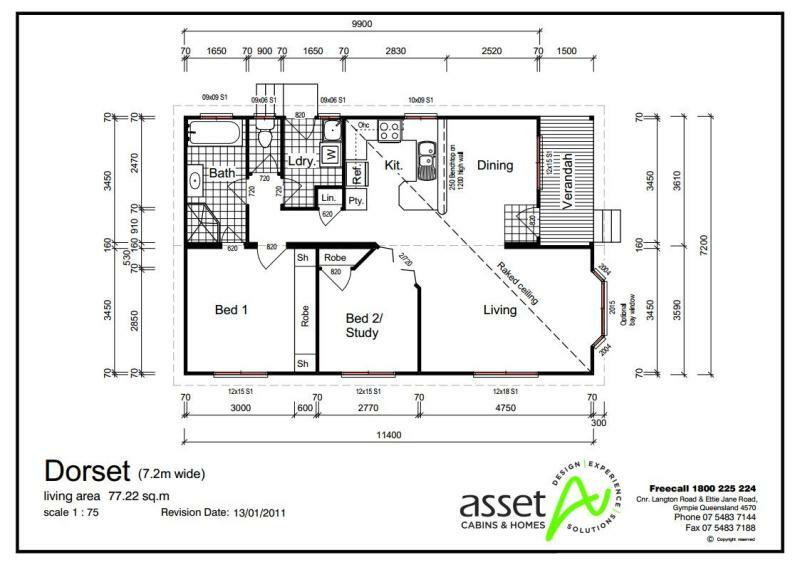 Dorset is a versatile premium relocatable home with two configuration alternatives: two bedrooms, or one bedroom and a study. The second bedroom/study has bi-fold doors at an angle off the living area. Both bedrooms have built-in wardrobes. A fully-equipped kitchen with a pantry and double sink adjoins the spacious open-plan living/dining area under the dramatic raked ceiling. An optional bay window (shown in illustration) can add extra style. The shared bathroom, featuring a bath as well as a shower, can be accessed via the main bedroom or hallway. Asset Cabins & Homes can modify this design to suit your requirements, and you can add your own style by choosing from our huge range of optional exterior and interior features. See Creative Services for ideas! Contact us for more information or to discuss your requirements.